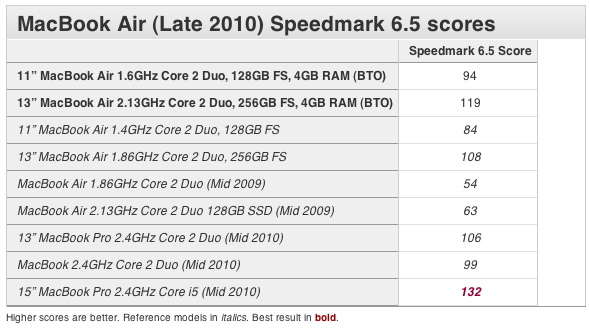 Macworld magazine ran some benchmarks on different MacBook Air configurations in addition to the default configs. Basically increasing the CPU of the 11 inch MacBook Air to 1.6GHz from 1.4GHz and 4GB DDR3 RAM from 2GB. As for the 13 inch MacBook Air it got upgraded to the 2.13GHz option (from 1.8GHz) and 4GB DDR3 RAM (from 2GB). Here are the speedmark results of these MacBook Airs compared to previous generation MacBook Air, current MacBook Pro 13 inch, current MacBook 13 inch and current MacBook Pro 15 inch with Core i5 CPU. Thanks to the SSD drive the MacBook Air’s performance is better than current MacBook Pros running on Core 2 Duo. It’s still not as fast as a Core i5 MacBook Pro of course. Our Speedmark 6.5 results show the BTO 11-inch MacBook Air topping its standard configuration version by 12 percent, overall. The biggest individual test gains were in iTunes encoding and our multitasking test, which were both 16 percent faster on the BTO 11-inch MacBook Air. Aperture was 14 percent faster, and iPhoto and HandBrake were both 13 percent faster. The 13-inch MacBook Air BTO configuration was 10 percent faster than its stock configuration. Individual application highlights include Aperture and our multitasking tests that were both 15 percent faster, and iPhoto was 14 percent faster. I understand that this is supposed to be great but i cringe whenever i read a review that the new Macbook Air, particularly the 13″, is faster than the current MBP 13″ and is almost at par with the 15″ i5. Not that i don’t like the Air having a good performance, its just that i feel cheated that Apple would make an Air run as fast as the Pro. The “Pro” monicker ought to mean something significant; its supposed to be Apple’s premium portable product Â but now it seems only a very thin line separates the two Macbook families. Is Steve Jobs intending to kill the 13″ MBP? I understand your sentiment and I for being a macbook pro future buyer will think twice on thinking which product will deliver better performance tagged with a cheaper price. But let us also think that this would be the start of a new and improve pro line units in their next update and of course better than what currently air has to offer.